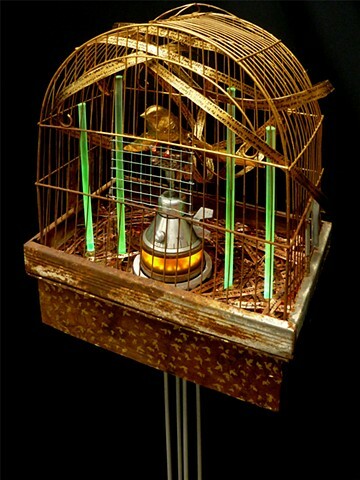 One of The Tinman Gallery’s past invitational themes was fairy tales from The Brothers Grimm. I chose a terribly long and pointless story called The Golden Bird. You know: a prince, two bad brothers, a talking fox, a magic horse, a princess under a spell, and so on. Everything happens in threes, bad things happen to good people, good things happen to bad people and finally, in the end, really good things happen to the good guys and the bad guys really get it bad. But the title is about the Bird so I focused on that. About one-third of the entire story is hand-written on the bird’s tail (tale on the tail…get it?) and the rest is recorded on the copper bedding lining the bottom of the cage. What’s with the green rods? They’re magic. Really.